The G-Class gets the most extensive update in its 40 year history - can it honour its legacy while stepping in to the present day? 'Stronger than time', that's the chosen slogan for Stuttgart's quadragenarian off-roader. It's written in the press packs, uttered by the engineers, and even printed in that oh-so-familiar Mercedes font down the side of one of the test cars awaiting us in Perpignan. The thing is though, it wasn't, which is kind of why we're here. The automotive world has changed a great deal since the 1970s and however many horsepower, yards of leather, or even wheels Mercedes bestowed the G-Class with, the unavoidable truth was that it was no longer fit for purpose. This is a fact belied by news that last year was actually the model's strongest for sales. Ever. 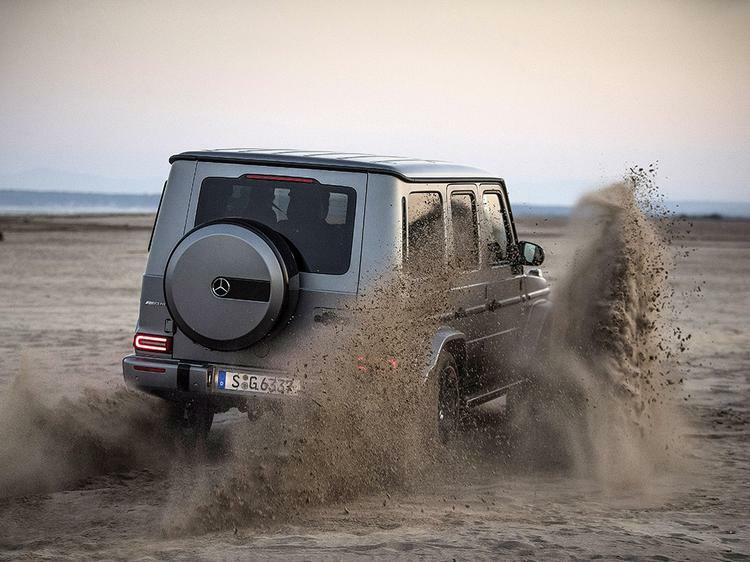 The G63 has always been an illogical vehicle though; rugged and fast without being particularly usable or quick on road, appealing to buyers more for what it represents than what it is, what it can do rather than what it feels comfortable doing. Which is something Mercedes has decided to change. So while the new car harks back to its predecessor in many of its details - some painstakingly achieved - there should be no misunderstanding the fact that this is a completely different machine to what came before. There is a new body, new chassis, new suspension, steering and gearbox. Gone is the old 5.5-litre V8, replaced by the 4.0-litre motor from the AMG GT which in this installation puts out 585hp and, from just 2,500rpm, a whopping 630lb ft of torque. 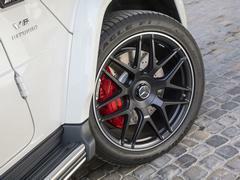 It propels the G63 from 0-62mph in just 4.5 seconds - nearly a second faster than the old car. Such an improvement has been made possible in part due to the extra 40hp, but mainly to the 2,560kg kerb weight. That's a lot, but its 170kg lighter than the outgoing model, a loss attained alongside a simultaneous 55 per cent gain in torsional rigidity, thanks largely to a new blend of steels for the chassis and the extensive use of aluminium for the wings, bonnet, doors and tailgate. Upon climbing into the brand new cabin, two things are immediately apparent. 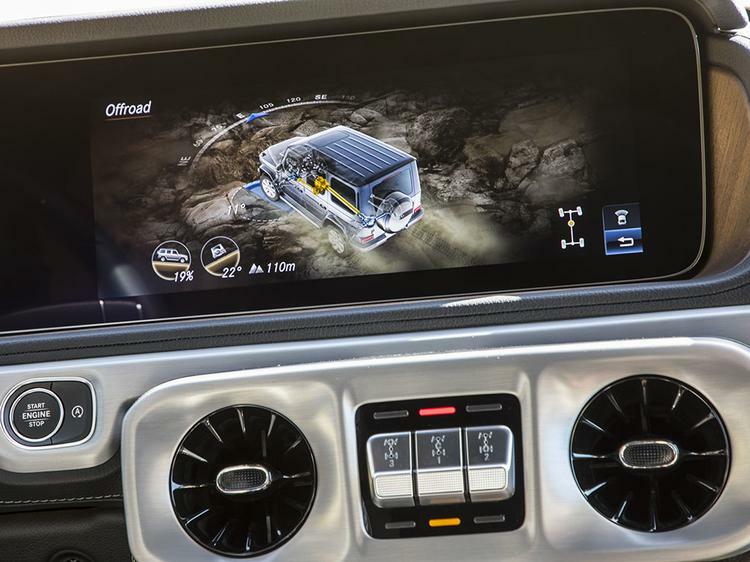 The first is the 12.3-inch instrument display, sitting as it does alongside an equally proportioned infotainment screen and giving the interior of the G-Class a 21st century feel sorely lacking in the outgoing model. The second is the amount of space; the new car is 53mm longer and 121mm wider than before, allowing most noticeably for an extra 68mm of front elbow space and 150mm of rear legroom, both gains for which future occupants will be grateful. It may make a big difference inside, but that extra width is easily concealed on the road. The replacement of the archaic recirculating ball steering with an electromechanical rack and pinion system means the G63 can now be placed confidently and accurately, even down the narrowest of rural French lanes. Where previously the G was vague, leading you to give it an extra 10-15cm of room just in case, it now feels far, far sharper. Gone, too, is the need to begin applying lock three or four metres ahead of a turn, and to start winding it off whilst only half way through. 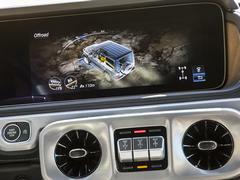 Where the outgoing model was a handful, feeling every inch the military appliance it was designed to be, the new one can be comfortably controlled with one hand, and driven just any other SUV. Alright, perhaps not any other SUV. It may not possess quite the earth-shaking warble of the old 5.5, but dip the accelerator and, alongside an incredible surge of power, the 4.0-litre twin-turbo emits a frantic volley of noise, urging you to push all the way to the 7,000rpm peak as it crescendos from the twin side-exit exhausts. Once there it bounces off the rev limiter, the dashboard pulsing red like the Enterprise on alert until, with a flick of the right-hand paddle, the next wave of sound and speed is unleashed. Leave it in automatic and the nine-speed 9G-Tronic transmission will take seamless care of the work for you, allowing you to simply plant your right foot and cling on to the wheel as the traction control scrabbles for grip before that addictive combination of power and noise slingshots the G-Class smoothly towards the horizon. 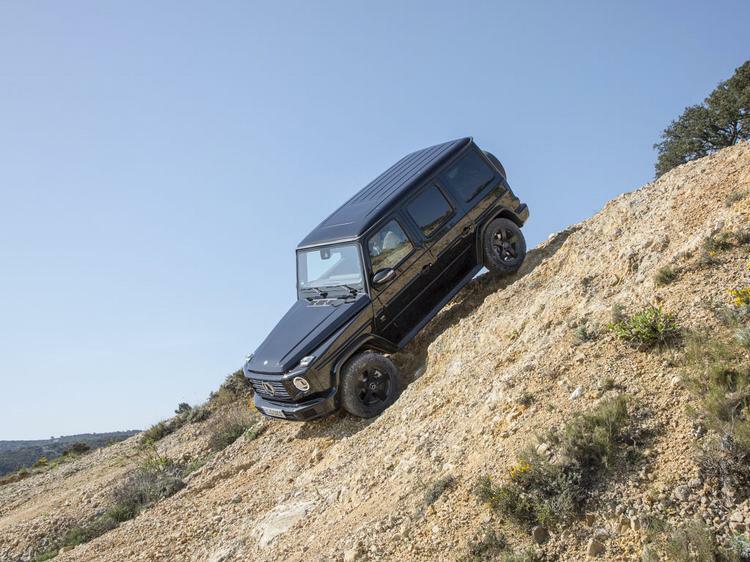 Straight lines are all well and good but there is, of course, only so much that can be done to disguise the size and weight of a vehicle like the G63. Understeer is an ever present concern but with double wishbone front and multi-link rear suspension, adaptive dampers, and additional anti-roll bars on the front and rear axles - not to mention that stiffer chassis - it now consumes corners with the same eagerness it does petrol. The confidence to lean on the outer wheels, which communicate their level of grip through that new steering and chassis superbly, is an all-new facet of the model's handling. 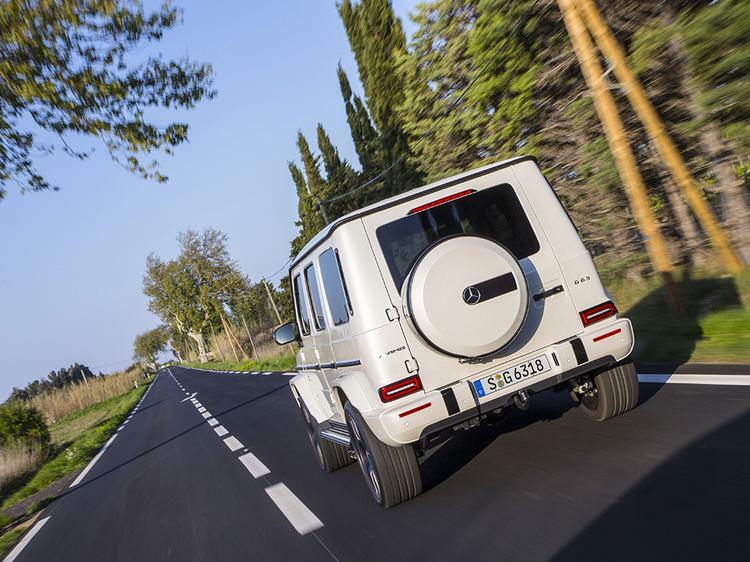 A group test is required to confirm, but on this evidence the G63 feels more than capable of matching the likes of the Range Rover Sport SVR and Porsche Cayenne Turbo for cross country pace. On anything but a motorway, the old car wouldn't have seen which way they went. Off road, though, the contest is over before it's even begun. 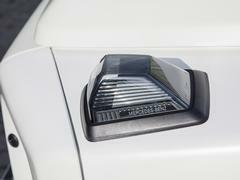 The G-Class is the only series production vehicle with three fully locking differentials and a low range gearbox. In development it was benchmarked against the Land Cruiser and Range Rover to ensure it could outperform both, then driven 178 times up and down the Schöckl test mountain, a distance of over 6,000km, to ensure it could outlast them too. With 241mm of ground clearance, approach and departure angles of 27 and 30 degrees respectively and the ability to climb a 45 degree slope - with the appropriate tyres, of course - the G-Class remains as supreme off road as ever. This is where the 422hp G500 - which isn't yet confirmed for the UK market - excels, doing without the 22-inch rims and blingy trim which only serve to hinder the 63 over the toughest terrain. On tarmac it's just half a second slower to 62mph than the outgoing G63, but the trails of the Chateau de Lastours, upon which the original G-Wagen was developed, are where it feels most at home. A combination of the offroad 'G-Mode' and one or more of those diffs, allowing it to in turn crawl and scramble its way up - and down - seemingly impossibly steep inclines, strewn with small boulders and riven by gullies, before wading through up to 700mm of water. Lastours also boasts a slightly less aggressive test track, used to hone both Rally Raid and WRC cars. Even over this rutted, rocky and gravelly ground the G63 is still capable of carrying remarkable speed. The additional 'trail', 'rock', and 'sand' modes - accessible on top of the standard 'comfort', 'sport', 'sport plus', 'individual' and 'slippery' settings once in G-Mode - ensure it remains surefooted and, if you dare, even a little slidable. What is the point of all this though? A vehicle starting at £143,305, capable of such impressive performance both on and off road, when most buyers will only ever use it to strafe Kensington High Street with that exhaust. Well, even those people will notice the improvements made to the interior, steering and ride quality, and who's to say that their applications for the G-Class are less legitimate than anyone else's? 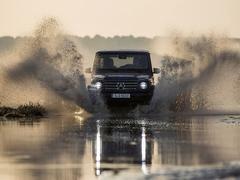 There's also the G-Wagen's legacy to consider. As the only vehicle in Mercedes' lineup with no set end of production, it holds a unique place for the brand. This is evidenced by the lengths which have been gone to to preserve its design. Those indicators on top of the bonnet, for instance, aren't so great for pedestrian impact safety but were judged to be a crucial part of the styling. Instead of simply moving them, then, Mercedes invested hundreds of hours in developing a design that could collapse on impact while still complying with visibility regulations. The same goes for the dash-mounted grabhandle, which got in the way of airbag deployment, so the airbags were re-designed to deploy around it, while the exposed door hinges, rear-mounted spare - take note, Discovery - and bolt-action sound of the central locking all return as well. Preserving what makes the G-Class a G-Class, rather than simply creating an urban-dwelling pastiche is important to Mercedes because it represents the integrity of the brand, and has done for so long, in a way that no other model quite can. Despite an avalanche of SUVs from other manufacturers, including Lamborghini, the G remains in a class of one. For that reason, any buyer who found appeal in the previous model, will find the same thing here. What they'll also find though, for the first time in a modern context, is a genuinely useable vehicle. Pleasant to drive at low speeds, enthralling to experience at high ones, and comfortable to cruise in between. 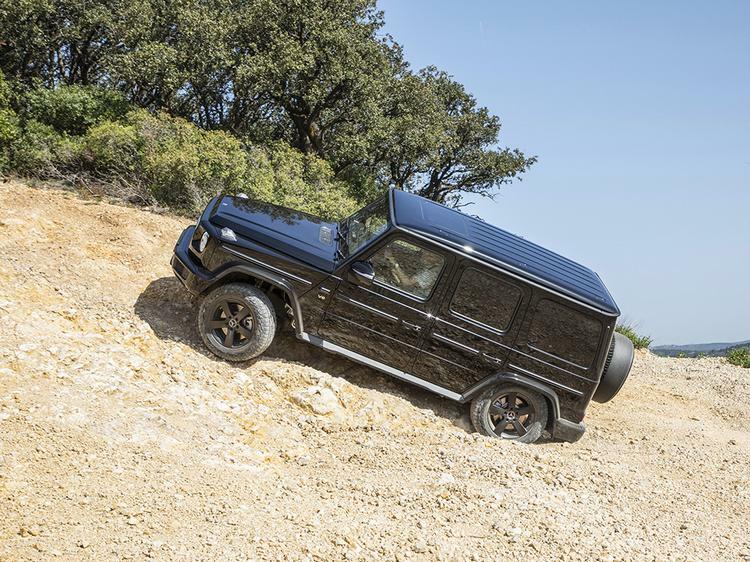 This overhaul places the venerable G-Class firmly back ahead of its upstart rivals, a position in which, if Mercedes has its way, it'll remain for another 40 years to come. Ridiculously desirable. Only current example of a mainstream manufacturer making a truly capable, retro styled car? Absolutely love the G and this one looks fantastic. Head and shoulders above the competition. No doubt about that! I’d rather like one. Probably has reliability and longevity to shame any of JLR’s increasingly blingy products. Oh my! It's a lovely looking piece if kit! I'm glad that get kept the important design cues, unlike Land rover's new Defender.